Winner of the Costa Biography Award, a fascinating exploration of one of the twentieth century’s most influential poets. Edward Thomas was perhaps the most beguiling and influential of the war poets. This haunting account of his final five years follows him from his beloved English countryside to the battlefield in France where he lost his life. When he met the American poet Robert Frost in 1913, Thomas was tormented by feelings of failure in his work and in his marriage. With Frost’s encouragement he began writing poem after poem as he finally found the expression for which he had spent his life searching. But the First World War put an ocean between them: Frost returned to New England while Thomas enlisted and went to fight in France. It is these roads taken—and not taken—that are at the heart of this unforgettable book, which culminates in Thomas’s tragic death on Easter Monday, 1917. 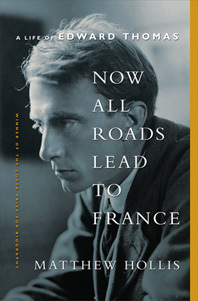 Now All Roads Lead to France encompasses an astonishingly creative moment in English literature, when London was a battleground for new, ambitious writing. A generation that included W. B. Yeats, Ezra Pound, Robert Frost, and Rupert Brooke was “making it new”—vehemently and pugnaciously—and this dazzling biography places Thomas firmly in their midst.